Stahlquartett is a German ensemble started in 2001 by instrument builder/musician Jan Heinke. Each musician in the group plays a steelcello developed by Heinke. This steelcello, designed to be bowed, is a string instrument with a series of perfectly tuned long metal bars of varying length connected to a thin stainless steel surface that functions as a resonance body with its very own timbre and texture. The steel cellos are designed using tuning and playing techniques which allow the interpretation of complex compositions and harmonies. Live performances are mostly acoustic so the characteristics of the space where the concerts take place have a significant influence on the sound. Each musician of Stahlquartet has had a classical background and the groups repertoire lies within the (contemporary) classical music and jazz aswell as in the abstract avantgarde sound art. First class soundsculpture in the tradition of Robert Rutman, the Bothers Baschet or Harry Bertoia. Remko Scha is an internationally renowned composer and performer. He started experimenting in the 60’s with the New Electric Chamber Music Ensemble, an improvising multi-media music ensemble including Willem Breuker, Gunter Hampel, Moniek Toebosch and Paul Panhuysen with whom he later founded the experimental music and visual arts center ‘Het Apollohuis’ in Eindhoven. In these days Scha already planted the seed for the ‘Machines’ which he conceived in the late 70’s. The Machines are a group of electric motors that play electric guitars by means of rotating strings, brushes or ropes. When the rotating speeds of the motors are varied, different rhythms emerge from the interactions with the guitars, in an aleatoric way and without human intervention. The sounds result in a static minimal, percussive punky string play not unlike the early work of Glenn Branca or even Indian raga’s. The performance of the Machines in New York in 1980 has been a big influence to the sound of Sonic Youth. Scha’s works have been released on Dutch labels like Kremlin and Staalplaat. Besides the music work Scha is a professor in Amsterdam, teaching computer linguistics. 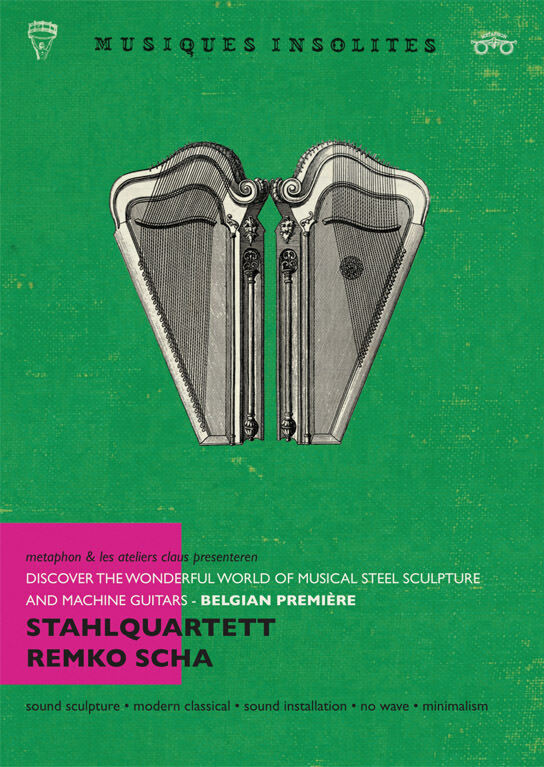 On this event of Musiques Insolites Scha will perform a variation of his ‘Machine Guitars’.